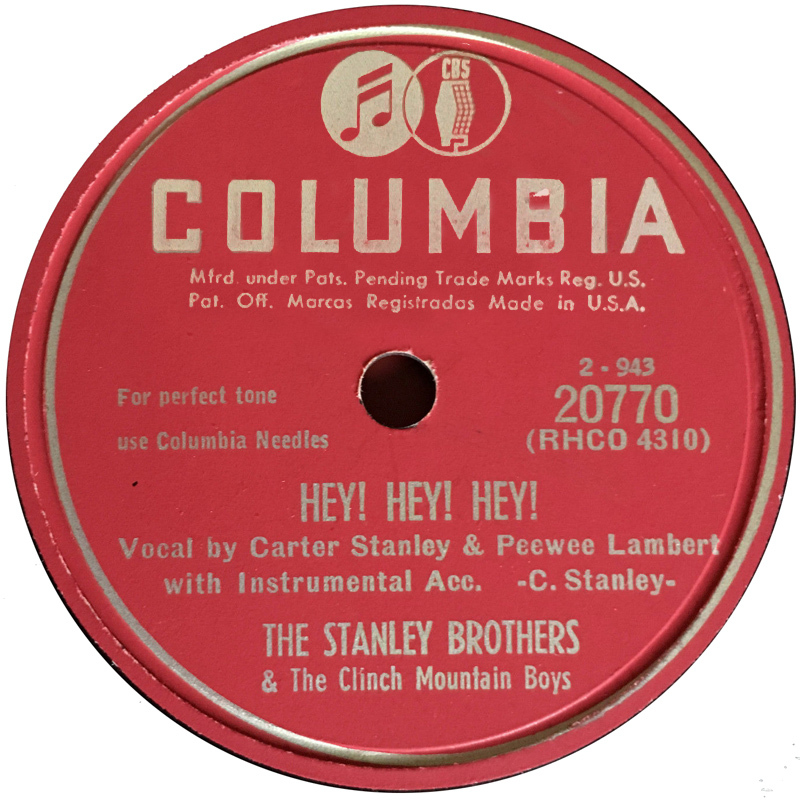 The Stanley Brothers - Pretty Polly / Hey! Hey! Hey! This single couples one of Ralph's life-long signature songs, Pretty Polly, with a Carter Stanley original Hey! Hey! Hey!. As children the Stanley Brothers had learnt Pretty Polly from their father. The song however is much older, being a trimmed down descendent of an old English murder ballad, The Gosport Tragedy. This originated circa 1726 and told the true story of a gruesome murder by an English navy seaman of his pregnant girlfriend. Ralph's vocal on the Columbia version, are more restrained than on later versions, when his voice had more 'age' to it. The single was mentioned in the "Advance Folk (Country & Western) Record Releases" column of 'Billboard' magazine in the 27th Jan 1951 edition. In fact the columnn mentioned the release twice, with either side listed first. 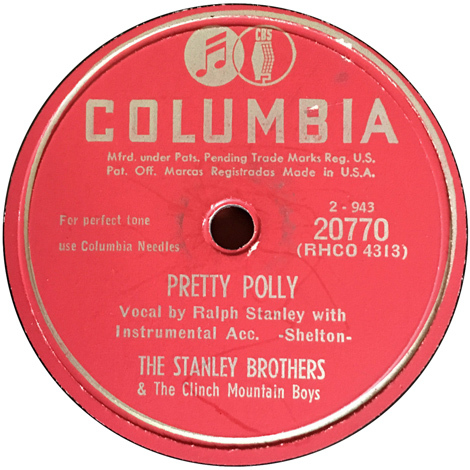 On the Columbia release, Pretty Polly is credited to "Shelton". i.e. Benjamin Frank Shelton who recorded it at Ralph Peer's now historic 1927 Bristol sessions. Shelton's version was released on 78 Darling Cora / Pretty Polly (Victor 35838) 1927 and can be heard on youtube. Pretty Polly was re-recorded by the Stanley Brothers in 1964 for the John's Country Quartet LP. Ralph also cut versions on his Play Requests and Clinch Mountain Country (with Patty Loveless) releases, along with at least eleven different live versions. Hey! Hey ! Hey! was later re-cut by the Stanley Brothers for their 1961 Sing The Songs They Like Best LP, whilst Ralph also recorded it with Sammy Adkins on You're Still To Blame and on the 50 year Clinch Mountain Boys Reunion 2xCD. Both sides of the original release can be found on The Complete Columbia Stanley Brothers CD. For a detailed breakdown and background to the Stanley's session, check Gary B. Reid's The Music Of The Stanley Brothers book, pages 28-30 and 37. See the Mike Seeger 1966 interview with Carter.